Franklin Street Works presents It Narratives: The Movement of Objects as Information, an exhibition featuring artists’ projects that engage the postal system and its intersections with digital communications media. The artists in It Narratives find forms for everyday experiences of distance and time by reflecting on the way objects move through information networks. The exhibition is curated by New York-based guest curators Brian Droitcour and Zanna Gilbert and is on view from September 6 – November 9, 2014. 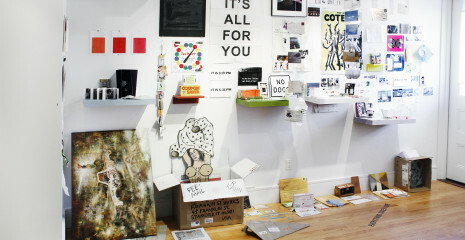 With areas of expertise in mail art (Gilbert) and Internet art (Droitcour), the curators take into consideration how Internet technology and digital forms of commerce have changed the way artists use the postal system. Mail art emerged in the late 1960s as a collective, networked medium allowing artists to circulate and exchange works and ideas in a sphere uncontrolled by curators, institutions, the art market, or state censorship. Today, mail is employed less frequently as an artistic medium, in keeping with an overall shift in how information is experienced and exchanged. News and greetings from friends and family have migrated from the postal system to the faster networks of email and social media, yet “snail mail” has not become obsolete. Sending objects over great distances is part of online commerce. Print-on-demand services that allow users to design their own T-shirts, books, or mugs with a few clicks of a mouse connect Internet browsing and data input to receiving objects by mail and handling them in everyday life. It Narratives: The Movement of Objects as Information takes its title from a prose genre popular in the late 18th century, the “it-narrative.” These were accounts of objects circulating in the structures of emergent industrialized capitalist markets written in the first-person from the perspective of the objects. It Narratives the exhibition updates this concept for the 21st century by presenting artists’ projects that track the movement of objects online and by mail, taking measure of the physical and emotional experiences of time and distance inherent to these networks. Brian Droitcour is a writer, translator, curator, critic, and a PhD candidate in comparative literature at New York University. Previous exhibition projects include “BFFA3AE – DTR” at 47 Canal in New York and “Big Reality” at 319 Scholes in Brooklyn. He has contributed reviews and essays to Artforum, Art in America, and Rhizome, among other publications. He has been yelping since January 2012 and his account was awarded Elite status last year. His web site fifteenstars.com, a collection of found Yelp reviews with commissioned illustrations and an accompanying essay, was featured as part of the New Museum’s First Look series of online exhibitions in October 2013. Among other projects, Brian is currently editing Klaus_ebooks, a series of artists’ ebooks published by Klaus von Nichtssagend Gallery. Zanna Gilbert is a postdoctoral fellow at The Museum of Modern Art (MoMA) in New York and she holds a PhD from the University of Essex and Tate Research in the UK. Her research focuses on artists’ networks and the transnational circulation of art through the mail. She curated the exhibitions Felipe Ehrenberg: Works from the Tate Archive (2009), Intimate Bureaucracies: Art and the Mail (2011), Contested Games: Mexico 68’s Design Revolution (2012), Daniel Santiago: Brazil is my Abyss (MAMAM, Recife, 2012; MAC-Niteroi, Rio, 2014) and Edgardo Antonio Vigo: The Unmaker of Objects (MoMA, 2014). She has taught postgraduate courses at the University of Essex, UK and the National Autonomous University of Mexico (UNAM). This exhibition is sponsored, in part, by the Andy Warhol Foundation for the Visual Arts. Thank you to our in-kind sponsor, MakerBot Store, Greenwich, CT. MakerBot is leading the Next Industrial Revolution by setting the standard in reliable and affordable desktop 3D printing, scanning, and entertainment. MakerBot Store, Greenwich, CT is located at 200 Greenwich Avenue, Greenwich CT, 06830. Greg Allen, Tyler Coburn, Tim Devin, Yevgeniy Fiks, Lukas Geronimas, Frank Heath, David Horvitz, Jean Keller, Alexandra Lerman, Kristin Lucas, Cat Mazza, Kristina Lee Podesva and Alan McConchie, Paul Soulellis, Emily Spivack, The Thread, Ehren Tool, Print All Over Me, Forms of Melancholy, Lance Wakeling, Roberto Winter.